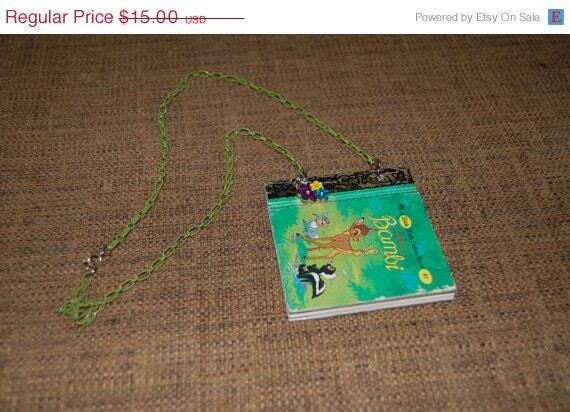 I would like to introduce you to Nikki's Etsy Shop, "Once Upon a Time, Again." She found her way to Etsy when she did a Google search for a certain item. Once she found the trove of handmade treasures, she was hooked. She joined Esty as a buyer in November 14, 2008, and she unveiled her Etsy shop in February of 2011. Most of the gifts for her friends and family are purchased on Etsy. When she started her own website, she used to host monthly giveaways, but only from Etsy stores. 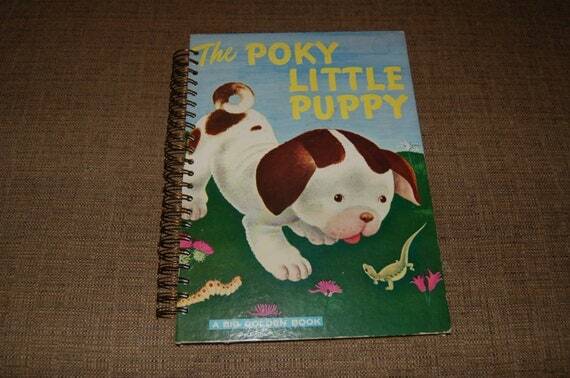 nostalgic Little Golden Books to create journals. She has many fond memories of Golden Books from childhood. When other kids got a sucker after going to the doctor's office, she would get to pick out a Golden book. 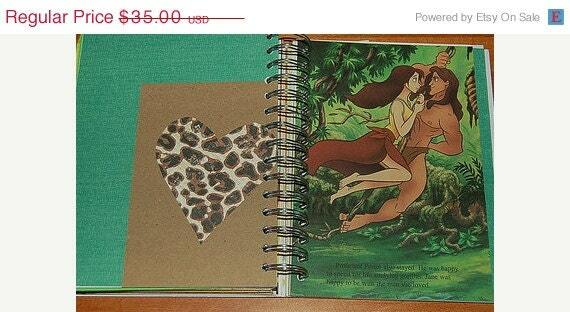 She sells Upcycled Golden Book Journals and Upcycled Custom Disney Autograph Books. 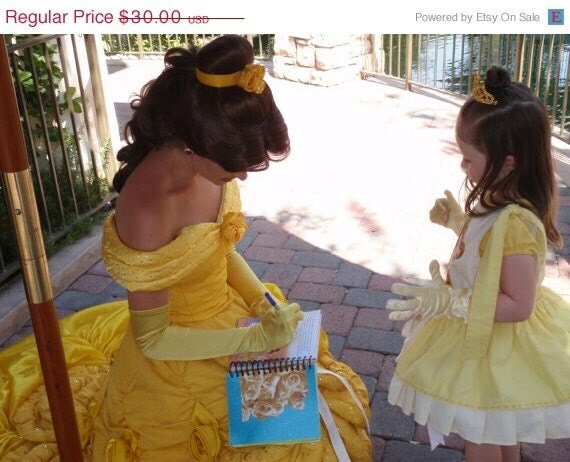 The autograph books are the hottest items in her shop. She also creates Disney Honeymoon Autograph Books featuring Disney Couples, such as Lady & the Tramp, Rapunzle & Flynn, Beauty and the Beast, etc. They are always well received. She also sells a smattering of kitsch jewelry using recycled materials, and miscellaneous journals made out of recycled materials from time to time. These items will show up when she feels the need to create something new! To tell you a little bit about Nikki, she will be 36 on July 4th! She is currently living with her boyfriend, 2 cocker spaniels, 1 golden doodle, 2 chinchillas, a friend, and her 7-year-old and 1-year-old child. And a partridge in a pear tree! She considers herself a helper, and would do just about anything to help someone else if the need arises. She is also big into Sexual Assault Survivor advocacy online. She ran her own website and message board from 2006 until a month ago. She sells insurance with her Musical Theatre degree, and enjoys blogging, journaling, and writing. Etsy is not the only place to find her products for sale. She also sells them at a shop called "A Gal Named Cinda Lou's" which is a 50's, 60's, 70's kind of shop. They have 3 locations: State Street in Westerville, one on OSU Campus, and another one in the Short North. Here is a link if you would like to learn more about the store: "A Gal Named Cinda Lou's" . She has some good advice for those who sell goods online. Never underestimate the power of having a Facebook Page for your store. A website does not hurt either. If you have a website, she suggests allowing followers to receive a monthly email newsletter from you, sharing updates with your fan base. She also suggests posting something to your Facebook Fan Page every day, even if it is a link to one of your products. Getting your products "out there" is a valuable tool. In her spare time, Nikki performs in plays and musicals around town, as well as doing choreography for shows. She is also writing a memoir and working on a zine for Sexual Assault Survivors (April is Sexual Assault Prevention and Awareness month). Inspirations for her are children's books, childhood memories, and reading to her 1-year-old nephew. She also is inspired by neat scrapbook paper and visual color harmony. Within the next five years, she hopes to expand her product base to include journals with prompts and possibly a recurring zine. This will always be a hobby for Nikki. She is not looking to turn this in to a full-time job. Her favorite quote: "The first time someone shows you who they are, believe them. "~Maya Angelou . Nikki has learned time and time again that there is truth in this quote. I hope you have enjoyed learning a little about Nikki and that you will take time to visit her shop: Once Upon a Time, Again . Great story, nice to hear more about Nikki! you're an amazingly talented writer, amy! thanks for featuring me! !